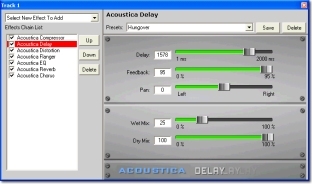 Acoustica Beatcraft is an extremely powerful, easy to use Drum Machine software program for beginners and professionals alike! It's friendly, streamlined interface makes beat generation fast, while allowing your unlimited creativity to pour through. Beatcraft features an extensive library of top-quality, professional drum sounds, powerful sequencing and loop generation tools, and killer audio effects, all wrapped in a clean and comfortable interface with a 32 bit state-of-the-art sound engine. Leave the dust cover on your drum set - Beatcraft is all you need to capture the power and rhythm of the world's best drummers. From light jazz beats to crushing hip hop beats, rap beats, heavy metal, 4-on-the-floor, straight ahead rock and roll to time-warping electronica and progressive rock, from dance and R&B to the edge of your imagination, Acoustica Beatcraft does it all! Drum for fun or drum for work. It's up to you what you want to do. 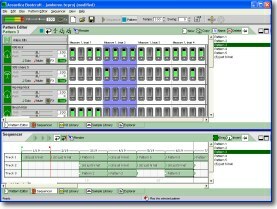 The pattern editor lets you focus on 1 pattern at a time. 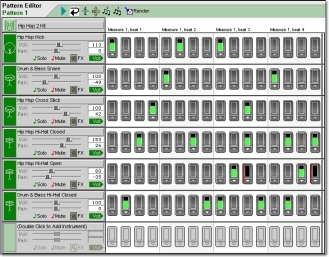 Simply click on and off steps, adjust volume, pan, effects and host of other parameters for each drum instrument! Beatcraft comes chock full of tons of samples...Tons of snares, kicks, hi hats, toms and more! The default download has 265 different super high quality sounds! (And it's only an 8 MB download!) Add your own, of course! 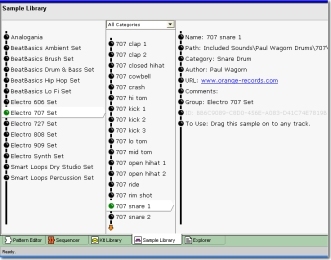 The kit library is your predefined collection of drum kits. If you want to get started in a hurry, choose a kit and start laying down your beats! The sequencer lets you layer different patterns together...This allows you to create the basis for a song which you can jam along with or render it out for integration with Mixcraft. Render your final beat out as a loop or an entire WAV, MP3, WMA or OGG file! Use any combination of effects to flavor your mix. 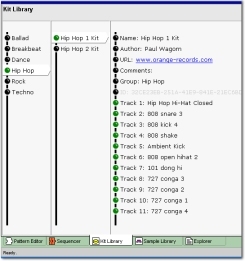 Add effect chains to each individual drum sample or globally. Effects include distortion, eq, delay, reverb, compressor, flange, and chorus.